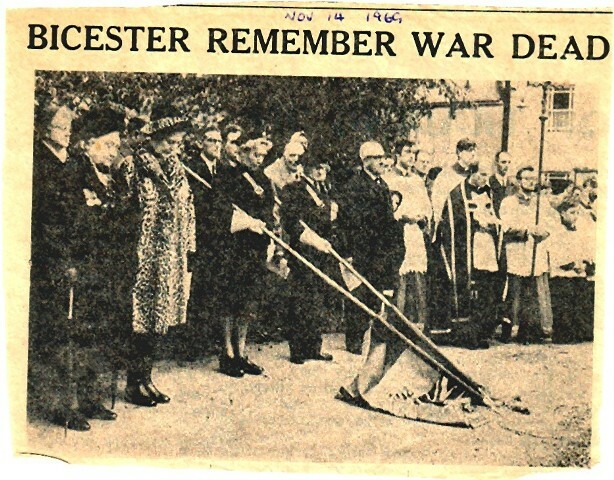 A cutting from the Bicester Advertiser reporting on the Remembrance Sunday Service of 1969. In the background, beyond the lowered standards, is a party from the Catholic church. THe altar server carrying the cross is Gerry Wright. To his right in the black cope is Fr. David Mead while to his right is Leo HUrst. The tall balding man immediately behing Gerry is Alfred Smith, a stalwart of the choir and APF co-ordinator in Bicester for many years. Many thanks to Gerry Wright for saving the cutting.